Supporting Ahmadinejad must be what the Cleveland Plain Dealer means by “colorful” behavior. Dennis Kucinich, the colorful Cleveland congressman and longshot presidential candidate, has outraged Jewish leaders in Northeast Ohio by insisting that Iran’s anti-Zionist leader is not seeking to exterminate Israel. 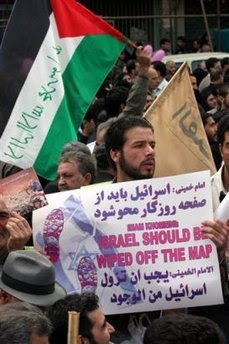 The message to “Wipe Israel off the map” is not lost in translation here as Kucinich insists. Mahmoud Ahmadinejad is regarded by many in the western world as a menace with nuclear ambitions, who recently called for supporters of Israel to, among other things, “burn in the fire of the Islamic nations’ fury.” Kucinich, however, says another translation of that and other statements is that Ahmadinejad merely wants regime change in Israel, not death to its people and supporters. He and Texas Republican Ron Paul – also a presidential aspirant – were the only House members to vote against a June 20 resolution condemning the Iranian leader and asking the U.N. Security Council to take up charges alleging violations of genocide conventions. Cleveland Democratic Rep. Stephanie Tubbs Jones and Lake County Republican Steve LaTourette were among the measure’s 103 co-sponsors. “Unfortunately, it goes beyond naive,” Alan Melamed, president of the Cleveland chapter of the American Jewish Committee, said in a phone interview Wednesday. More Kucinich– The “colorful” Ohio Representative lashes out at his democratic foes for limiting debates.